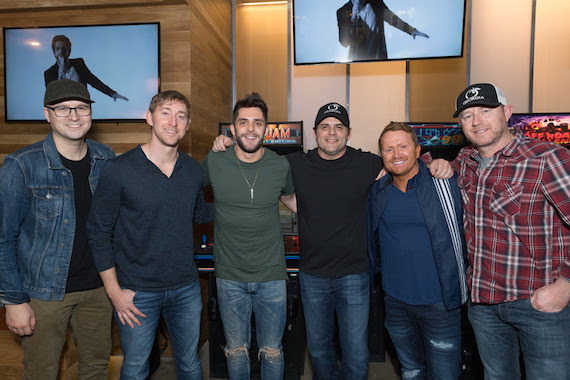 On Wednesday (March 1), the Nashville music industry gathered to celebrate Valory Music Co. artist Thomas Rhett’s two latest No. 1 singles, “T-Shirt” and “Star Of The Show.” The songs mark his sixth and seventh No. 1 singles to date. ASCAP’s Beth Brinker and Michael Martin, and BMI’s Leslie Roberts celebrated the writers for both songs. First up was “T-Shirt,” penned by Ashley Gorley, Shane McAnally and Luke Laird, and produced by Jesse Frasure and Dann Huff. Creative Nation’s Beth Laird continued the tradition of finding unique gifts for songwriters, surprising Gorley, Laird and McAnally with Guns N’ Roses tour jackets. Label execs and producers also received Guns N’ Roses caps. Also honoring the track were SmackSongs’ Robert Carlton, Universal Music Publishing Group’s Cyndi Forman, Combustion Music’s Chris Farren, and Warner/Chappell’s Ben Vaughn. “If anyone doesn’t think that Thomas Rhett is next, you’re wrong. 2017 is going to be a nuclear year for you my friend,” said Vaughn. ASCAP welcomed sponsor First Tennessee Bank, while BMI welcomed Ron Cox from Pinnacle Bank to help honor the songwriters. BMLG’s founder and CEO Scott Borchetta, as well as Valory Music Co. GM George Briner, also offered congratulatory words. Briner presented Thomas Rhett and the songwriters with crystal statues to commemorate the song’s radio success. Borchetta also recalled how “T-Shirt” was nearly recorded by Tim McGraw. Next, the crowd celebrated Rhett, his father and songwriter Rhett Akins, and Ben Hayslip for penning “Star Of The Show.” With “Star Of The Show,” Thomas Rhett and Rhett Akins became the only father-son co-write to ever top the Country Billboard radio charts. ASCAP’s Michael Martin, THiS Music’s Rusty Gaston, Sony/ATV’s Josh Van Valkenburg, Warner/Chappell’s Ben Vaughn and more gathered to honor the track. Gaston noted that Rhett Akins and Ben Hayslip have had 100 cuts on songs they have penned. Meanwhile, Van Valkenburg announced that Sony/ATV had made a donation to 147 Million Orphans, an organization that Thomas Rhett and his wife support heavily. “We were putting the deluxe package together last summer and we were going through some demos and songs that Thomas wanted to include,” noted Borchetta. “We had a different single picked for the fourth quarter and he sent me the demo for…the only thing that I think really existed was the live version from a radio station. Again, this was one of those songs that had been sitting for a while. I listened and responded by saying, ‘This is the single.’ Sometimes you have to be smart enough to get out of the way. We took this wonderful demo, of course Allison [Jones, of BMLG] was on board, and a wonderful thing happened.